As has become blatantly clear over the course of the past few months of blogging, I have a lot of stamps. A lot of stamps I don't even know what to do with. And I don't like chucking things out. But I do like re-using things. Given that postage stamps are little mini pieces of lovely design, it makes sense to use them. Lots of people who otherwise might not post things, tend to post things at Christmas. 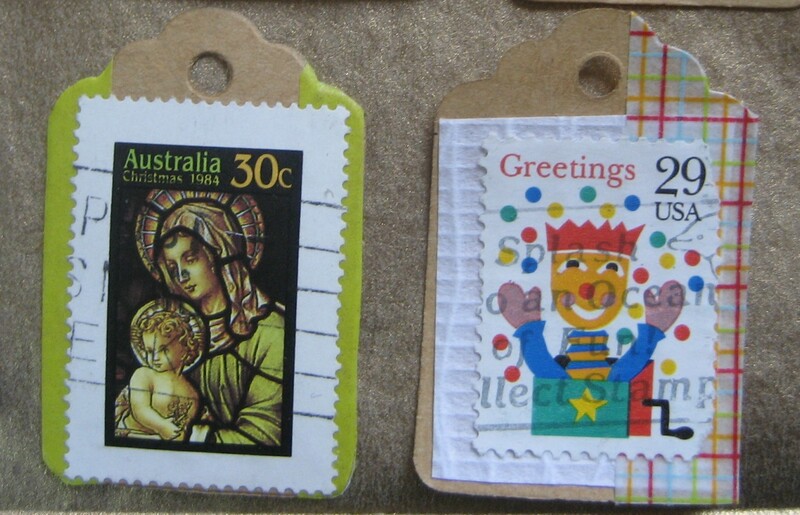 Therefore there is an abundance of Christmas stamps. I keep them all separately, and I have found the perfect use for them - as Christmas gift tags. I had a little 'crafternoon' the other weekend and sat down in the sun and made some tags to go on all the pressies that I was yet to buy.. although I still had plenty of things to do pre-Christmas, making gift tags is way more relaxing and fun than heading out into the madness of shopping centres, so that is what I chose to do. I meant to post this little craft project last week, but now it is so close to Christmas it is probably too late for people. 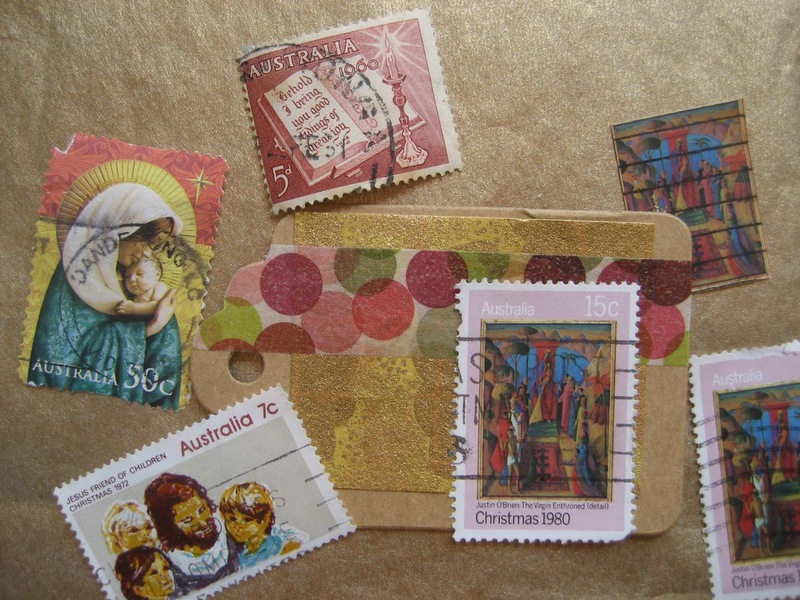 But, as you are sorting through the post-Christmas debris, you may wish to set aside your Christmas stamps for next year. I keep my Christmas stamps sorted in little black album cards. So now it is Christmas eve and it is now time for me to go and use these tags and wrap up my presents that will be sitting under the Christmas tree tomorrow. I don't think the USA stamp is necessarily a Christmas stamp.. but it works! 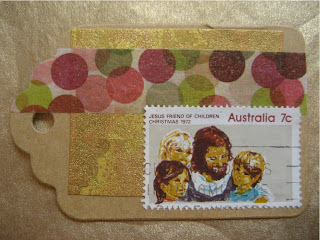 This is a bit of an unusual Sunday Stamps edition... apart from the fact it is now Monday here in Australia, but I thought this was a nice way of sharing some of my old Christmas stamps. And I have previously shared what I think about this year's Christmas stamps here, which you can check out if you haven't already. And with that I would like to wish everyone: Sunday stampers, friends, readers, passers-by, bloggers, and everybody else who has kindly supported this blog this year, a very Merry Christmas and a safe and happy festive season. 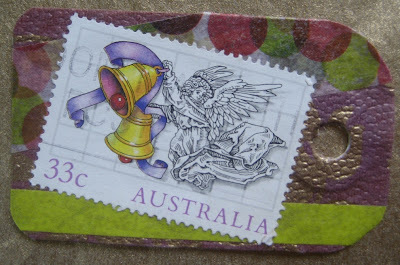 For other festive Christmas Stamps, check out other blogs through the Sunday Stamps link above. as for your post on the Christmas stamps your country has produced.... well, I don't mind the secular ones. I think they have a neat retro quality to to them. I am not familiar with Washi tape either. But your tags are great. Holy Cow, it's Christmas eve already in Australia! Must get going on my wrapping. Thank you for participating and I love stamps too! Helen, you are a genious. I have some Christmas stamps for you, but this year I am so unorganised and also looking for a new place to live, but I will send them in the New Year. Merry Christmas to you and your family. Merry Christmas Sandra! So nice of you to save stamps for me! Good luck with moving house and all the best for 2013! Excellent idea! Now it must be Christmas in Australia, so Merry Christmas, Helen!! Lovely labels Helen, wishing you a very Happy Hogmanay!! I have a stamp collection and I would like to share it. All the beautiful little images, all the delicate perforations, all the postmarks; well they make me smile. But a stamp is such a tiny thing, and it might just be tucked away in a dusty album and never see the light of day. 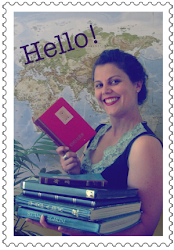 So this is my way of bringing the humble stamp out into the larger world. Find out more about "post" here. ...and I would love to hear from you! Oh, hi. It's been a while!